Yay, fall is here! Just as a fashionista gets excited for her scarves and boots, this foodie can't wait to get her hands on local autumn produce. It's shopping time....for pumpkins, beets, sunchokes, and every variety of winter squash under the sun. I chose to feature butternut squash in this easy, fall-inspired Southwestern Roasted Chicken and Squash dish. Squash is one of those great hearty vegetables that is cheap and filling, perfect for those shopping on a budget. (Yesterday, Slow Food hosted a national $5 Challenge, urging people to create a fresh, healthy meal under $5 per person- the same price as a fast food meal. Squash immediately came to mind as a staple ingredient.) In addition, its versatile: puree for an autumn squash bisque, or roast tossed in spices as I did in this dish! This recipe is easy to make, brimming with flavor and healthy. Smoky spices like chili powder and paprika are paired with sweet lime and honey and topped with a generous sprinkle of cilantro. Preheat oven to 425 degrees Fahrenheit. Coat a large roasting pan with a layer of heavy duty tin foil and cooking spray or a mist of olive oil. Mix all ingredients together except cilantro/parsley. Bake uncovered until chicken is cooked and veggies are tender, about 25-35 minutes. 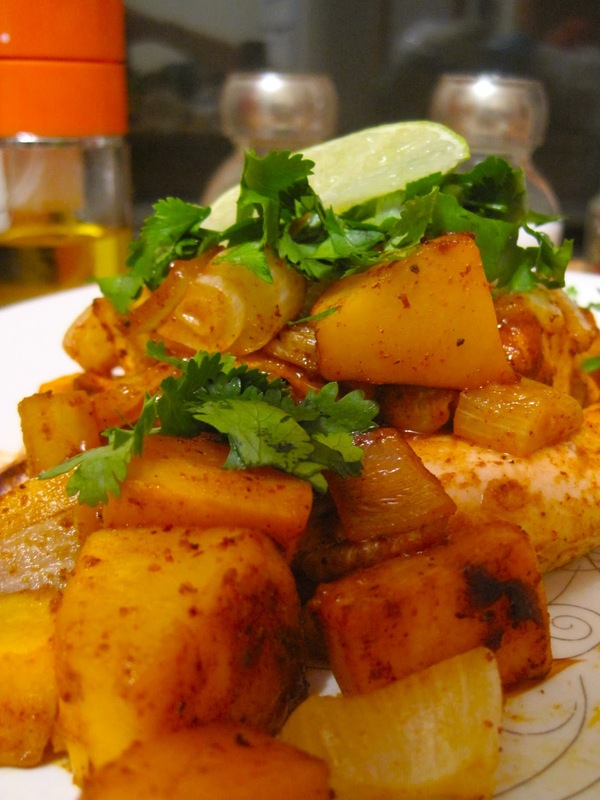 Sprinkle with cilantro and serve with lime wedges.